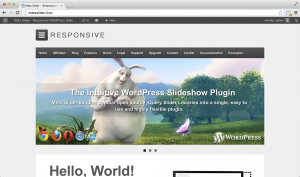 With nearly a million downloads, the Responsive theme for WordPress is one of the most popular free themes available. In our first blog post, we’ll look at how we can integrate MetaSlider to add a user friendly ‘MetaSlider’ drop down setting to the Responsive theme settings, and output the selected slideshow to the homepage of your site. Fortunately for us, the Responsive theme allows us to hook into it’s functionality using WordPress filters & actions, so we won’t need to make any direct edits to the template files. The Responsive theme allows us to modify the list of it’s available theme settings through WordPress filter called ‘responsive_options_filter‘. We’ll hook into this to add our new “MetaSlider” setting to the Home Page settings section. The following code should live in your themes ‘functions.php’ file. A quick check of the theme settings confirms we have a dropdown list of MetaSlider Slideshows in the Homepage section. The theme takes care of saving the selected slideshow ID, we’ll need to access that later. 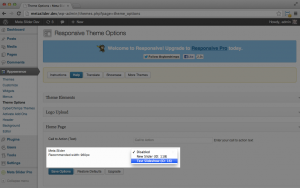 The Responsive theme allows us to hook into various places in the theme output. We’re going to use the ‘responsive_header_end‘ action which is located just beneath the navigation menu. The following code should live in your themes functions.php file. To get this functionality up and running on your own site, you can either copy and paste the code into your themes functions.php file (/wp-content/themes/responsive/functions.php), or install this handy plugin.